That box is made for sitting. Jeff and I shared a late meal at Tacos Mexicos and then watched the penultimate season finale of The Walking Dead. All of last night I dreamt that I was college professor working at a university. The overwhelming majority of people were zombies, but all were unaware that they were, well, dead. Those of us who weren’t zombies had to act is if we were zombies in order to not be detected and, well, consumed. For me, this meant eating rancid tacos. Huh? I worked out at 11 this morning, and completed a WOD I’m considering programming at CFS, albeit modified and scaled. I will indeed follow my own programming. I will, however, need to scale up on occasion. I had programmed pull-ups before box jumps but completed box jumps before pull-ups the first round so I continued to do so for remaining rounds. Uhm, I had programmed pull-ups before box jumps so as to not have to do box jumps after jumping air squats and to not have to do pushups after pull-ups. Dammit. I shoulda looked at the whiteboard. My goal, of course, was to complete all rounds of activities unbroken. I thought that pushups would be my downfall, as I completed far too many pushups, including HSPUs, throughout the day yesterday. Ring pull-ups were instead my downfall! I only made it through 7 rounds unbroken, and completed the 8th and 9th rounds in reps of 7 & 3 and the last round in reps of 6, 2, 1, & 1. Another goal was to complete in less than 30 minutes. I barely made it, finishing in 29:43. In addition to ring pushups, GHD sit-ups and jumping air squats presented little challenge. Seated box jumps, on the other hand, nearly killed me. I made sure to complete unbroken, and this entailed beginning in a seated position on the 17” box, jumping onto the 24# box, immediately sitting after jumping off of the box, and immediately jumping once again. Make sense? Good. Going on. This was one of the most difficult workouts that I’ve completed in quite some time. I listened to the Henry Mancini Pandora playlist today. Songs included Theme from The Pink Panther, Love Story, Walk on By, and Theme from Love Story. I’ve been watching the documentary “Jazz” by Ken Burns. I’ve never been a fan of Jazz, but I most certainly am now. However, I still am not a fan of Charlie Parker. Sorry! Duke, Fats, Louis, Brubaker, Goodman, yes. Bird, no. I’ve been listening to jazz music as I work out. Today, however, I listened to the Pandora playlist “Musica Mejicana”. Why, you ask? Because the hallway construction is being completed, the panic door hardware installed, and the inspections commencing! The landlord, while not making any promises, feels confident that everything will be complete by Friday. This Friday. I made sure to ask. A month later than I wanted, but I’m nonetheless happy. As I didn’t have a spotter, I didn’t truly establish maximum effort. I completed sets @ 95, 105, 115, & 125#, 70# of 1RM. I continue to enjoy bench pressing, and continue to grow stronger. Lots or arms and then lots of legs, which means lots of core. My goal was to complete unbroken, and that’s what I did. This was quite an aerobically challenging workout. I completed in 7:01. I almost forgot to mention: the orange door is being replaced with a much sturdier door. 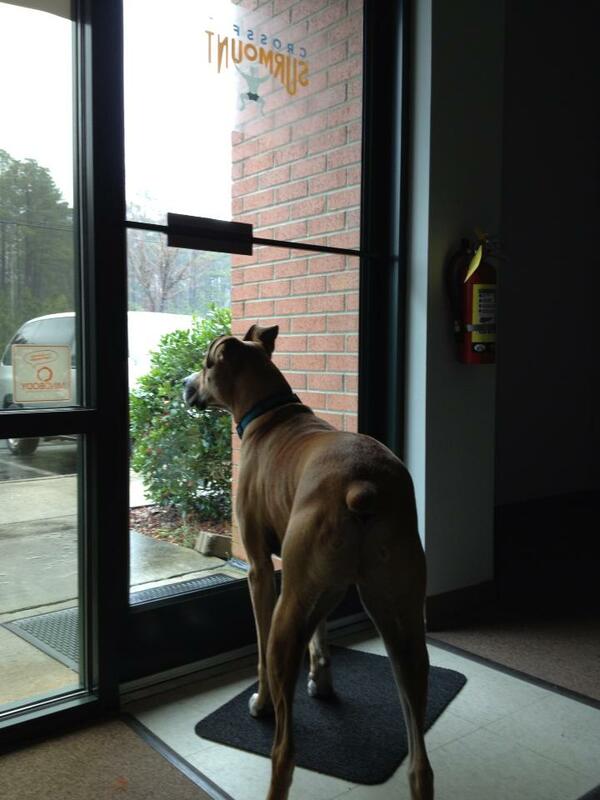 Luke is a great watchdog! Another incredible day at CFS! Luke’s Aunt Sandra visited, and Luke greeted her with a full-on hug. He put his front paws on her shoulders, pressed his body against hers, and kissed her face. He’s such a good boy! 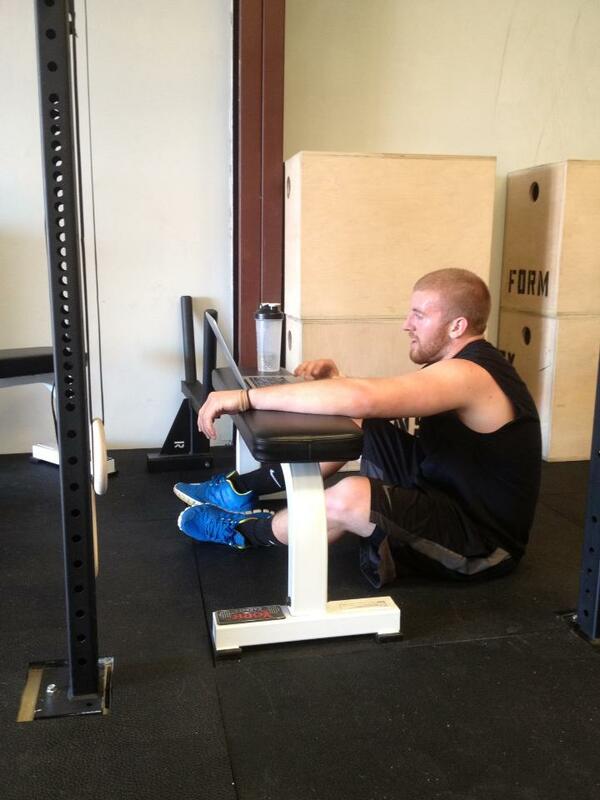 Jeff, Tyler, and Tyler’s friend, Patrick, completed 13.3 at CFS this afternoon. All did a great job. 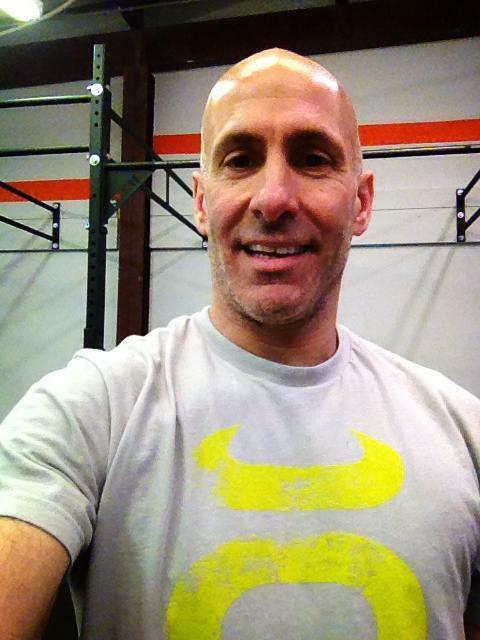 Patrick completed all 150 wall ball shots and 90 double unders – and then completed 9 muscle-ups! As Jeff was his judge, I didn’t get to witness his spectacularity. I just made up that word. I kinda like it. Say it out loud. Spectacularity. My very good friend, Rona (aka Rowna) captured everything digitally, and I’m looking very forward to seeing the splendiferous pictures she took. Rona asked if she could take a few pictures of yours truly, although she didn’t ask me to take off my shirt. She had the opportunity. “Do a few muscle-ups!” she exclaimed. Well, okay! I did my first muscle-up and heard Patrick say, “Strict muscle-up.” I sometimes forget that I begin a set of muscle-ups with a strict muscle-up. Because I can. I was quite disappointed. I really wanted to lift 3 reps at 205#. I began to remove the plates from the bar – and realized that I only removed the metal 10# plates. Thus, my last 2 sets were 205# and 215#! I exceeded my goal. Ha! 205 is 93% of 1RM and 150% of my bodyweight. I completed 136 double unders. As with any Tabata, my goal was to match or exceed number of reps completed during first 20-second set. Abmat sit-ups and lunges were easy compared to mountain climbers and push presses. I challenged myself by using 35# dumbbells for push presses. You guessed it; 70# is just 1# shy of half of my bodyweight. I managed to complete 12 push presses during the 3rd round and then told myself that I could complete just 10 reps the last round. Uhm, but my goal was to match or better each round, so I had to complete at least 11. The most challenging part of the entire metcon was completing 21 mountain climbers the last 2 rounds. I was sweating profusely and quite out of breath. This week, perhaps? I certainly hope so! The water fountains are installed and ready to be inspected! I can hardly believe it. 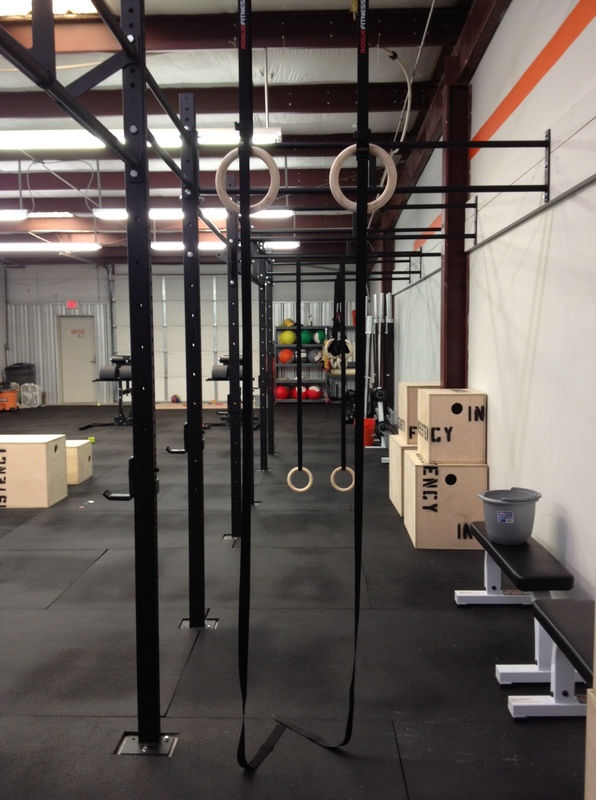 I once again invited friends and family to visit CFS for pre-opening WODs. Those who didn’t pass out had a good time. I was delighted that some friends from CFZ visited, including Debbie, Margie, and Nicole. And Paul A. I almost forgot about him. I failed to mention in yesterday’s blog that Wednesday I completed 30 muscle-ups, recording all reps and focusing on full extension of arms and turnout. What I discovered is that my first muscle-up is always with a false grip and with arm bent at elbow. Once I complete first muscle-up, I am able to switch to normal grip and with full extension. Gah! Not sure how I’m going to solve this problem that I’ll call “Maria”. I also completed 3, 5-minute plank holds with many, many variations. I’ve said it before; I’ll say it again. I have a 36-pack. I’m abulous. Abtasic. Abdorable. I worked out this afternoon. Why do I program such challenging workouts? Burpee and back squat (95#) ladder, i.e., 1 burpee & 1 bs, 2 burpees & 2 bs, 3 burpees & 3 bs, etc. My goal was to perform all rounds unbroken. I had to dig deep, but I achieved my goal. 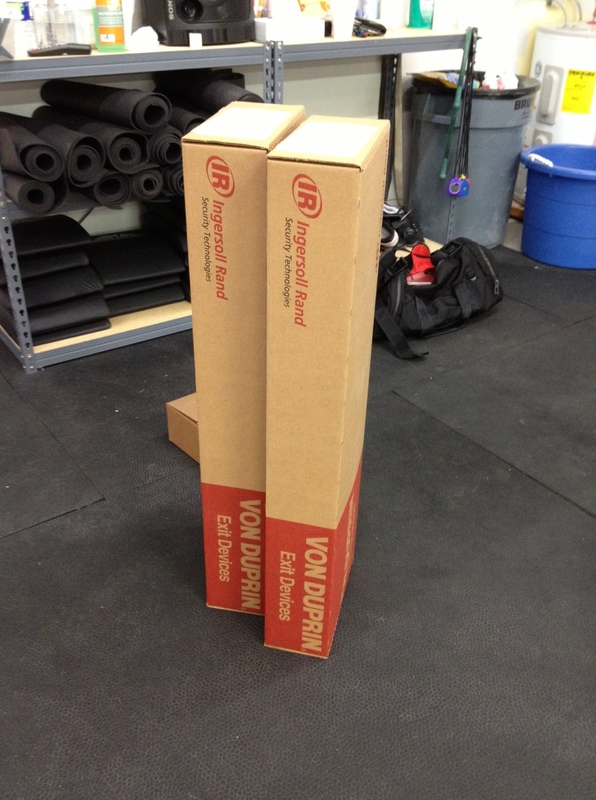 I can’t recall that I’ve ever done a burpee/back squat combo ladder, and I can understand why. While I love burpees, back squats (even though a mere 95#) were just painful. I completed 8 rounds + 7 burpees. KB swings and box jumps were just slightly less painful. I completed 10 rounds + 11 KB swings. I find chin-ups to be much more challenging than pull-ups, even though I know that for most people chin-ups are far easier than pull-ups. I completed 9 rounds + 6 chin-ups. Jeff and Luke had arrived by this time, and Luke’s attempts at kissing my face were a welcome distraction. Luke also decided to plant himself between the 2 cones I used to mark 10m. He’s a goofy dog. I completed 10 rounds with a few seconds to spare. I was very tempted to put down the KBs, but resisted the urge. The totals don’t look very impressive. Alternating activities and performing a ladder made this workout very demanding. Jeff says that he can’t believe how patient I’m being. I also can’t believe how patient I’m being. On a positive note, Luke very much enjoys all of the attention he receives from the workers. He’s a very popular dog! I worked out at 11 this morning, and it was good. The goal of this workout was to complete all 9 reps in quick succession – with proper form, of course! I recorded all sets and maintained good form until the last set. I began to overextend my back, so I called it a day. I had hoped to do a final set at 115#. Next time, perhaps. I did completed set at 65, 75, 85, 95, & 105#. Given that I wore a brand new shirt given to me by my very good friends Einar and Rona, I looked spectacular as I pressed. But, don’t I always? My very good friends Mary-Ann and Jay once again wanted to spend some quality time together, so I invited them to workout at CFS this afternoon at 1. They both said, “Plank you very much, Paul.” They are both fabulous, although not yet “abulous”, people. To make sure that the metcon I created wouldn’t completely destroy them and potentially end their marriage, I included it as part of my own workout. My goals were to complete all step-ups and K2E unbroken and to row 1 calorie per stroke. It took about 9 strokes to row 8 calories, so I was close. I did complete all step-ups without putting down the 35# KBs and/or resting between steps. I also alternated legs for each step-up. I completed all rounds of K2E unbroken and kipping, although my elbows didn’t touch my knees for the first rep of the last round. No, I didn’t count that rep. Do you even know me? It was a neck-and-neck race between Jay and Mary-Ann. Mary-Ann crushed Jay like a bug. Squish, squish. Granted she did scale, but still. Like. A. Bug. The following is one of the best email messages I have ever received: The above permit has been approved and is ready to be picked up in our office. See you soon! Yup, that’d be from the Town of Apex. I spoke with the plumbers this morning and the installation of water fountains will be complete tomorrow. Next up? Panic doors, you know, because it’s a disco and they’ll be a panic at the disco and all. I listened to classical music while working out, and I shall continue to do so. Gerhswin’s “Rhapsody in Blue” while deadlifting and Copland’s “Appalachian Spring” while metconning. Is that even a word? I care naught. I suppose as it’s the first day of Spring that Copland’s piece is appropriate. Deadlifts felt, well, heavy, as well they should. I completed sets @ 185, 225, 270, 290, and 305#. Once again, I completed a main site WOD – and I’m glad that I did. We will most definitely be doing this as CFS. This was both challenging and quite fun! My goals were to complete all rounds of reps unbroken and to keep my feet planted for strict shoulder presses, i.e., no pushing or jerking. If I open a gay bar that’s what I’m going to name it: No Pushing Or Jerking. Doing 4 unbroken shoulder presses and 8 unbroken SDHPs wasn’t that much of a challenge. Doing 12 unbroken front squats proved to be much more of a challenge than I thought it was going to be! As all lifts were from the floor, this meant I got to clean the bar before each set of presses and FSs. Notice I said I got to, not I had to. I’ve become quite fond of cleaning. And jerking. And cleaning & jerking. But not so fond of snatching. I made a stack of 5 poker chips and set the clock to count down from 12. All rounds of shoulder presses were completed unbroken. I did, however, go up on my toes during the last rep of the 5th round. Dammit. Having completing so many SDHPs in the recent past, this particular lift was the easiest of the three. I completing all rounds unbroken and also brought the bar to shoulders, mid-thigh, and then to the floor at the end of every rep, including the last of each set. I did complete all rounds of front squats unbroken, but boy/girl was it difficult to do so. I was tempted to rest the bar on my shoulders on more than one occasion. While completing the 6th round of FSs I thought, “This is the last time I’ll have to do this. Yay!” I was mistaken. I completed the 6th round with less than 3 minutes remaining. I completed a 7th round and really had to dig deep to do 12 unbroken front squats. I quickly completed 4 presses and 2 SDHPs before time ran out. 7 rounds + 4 presses & 2 SDHPs. As usual, I was a sweaty, blathering mess.